“Dear me! It is a strange world. Particularly the Indian division of it.” In 1895/6 the sixty-year-old Mark Twain set off on a worldwide lecture tour to pay off his debts from a publishing company bankruptcy, notes from which a year later became his final travel book Following the Equator. Two years later he wrote, “How I did loathe that journey around the world! Ã¢â‚¬â€œ except the sea-part and India.”Although he was only in India for just over two of the twelve months, his exploits and observations there take up forty per cent of the bookÃ¢â‚¬â€and by common consent are by far the best and liveliest part of it. In The Indian Equator the Mark Twain travel trilogist Ian Strathcarron, his wife and photographer Gillian and his factota Sita follow in his mentor’s footsteps, train tracks and boat wakes tracing the route that Twain, his wife Livy, his daughter Clara, his manager Smythe and his bearer Satan took as they crisscrossed the sub-continent. Leaving from the Bombay that was and the Mumbai that is, both writers follow the lecture circuit of old India-including what is now Pakistan-across the plains and cities of the north up to the peaks of the Himalayas by way of Baroda, Jaipur, Delhi, Agra, Lucknow, Benares/Varanasi, Calcutta/Kolkata, Darjeeling, Lahore and Rawalpindi. Staying in the same Raj clubs, travelling down the same train lines, meeting the high and mighty and the downtrodden and destitute, Twain and Strathcarron are absorbed by an India that then was and now is “not for the faint of heart nor mild of spirit nor weak of mind nor dull of sense nor correct of politic”; a rapidly changing yet still deeply traditional society where “a few hundred million have grabbed the twenty-first century by the whiskers and many more hundred million still tuck the nineteenth century into bed at night”. 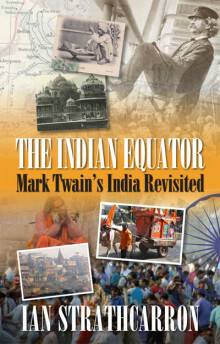 Mark Twain loved the India of 1896; like his trilogist, he would love it still.